Cardinal Bessarion--scholar, diplomat, book collector, and Platonic philosopher--was among the most remarkable men of his century. He was born an Orthodox Christian in Trebizond in Asia Minor, entered the Greek church as a priest, and converted to Latin Catholicism at the Council of Florence in 1438. Made a cardinal in 1439, he was twice nearly elected pope. The two great missions of his life were to preserve in the West the cultural heritage of Greek and Byzantine civilization, and to organize a great crusade against the Turks to reconquer Constantinople and the Christian lands lost to the Ottoman invaders. In the first of his goals he succeeded magnificently; he trained an entire generation of Hellenists in Rome and formed a great collection of Greek manuscripts which he left to the city of Venice, where it became the nucleus of the famous Biblioteca Marciana. In his second goal he failed, despite heroic efforts as a diplomat and publicist. On display is a collection of letters and orations Bessarion composed in the hope of stirring the princes of Europe to action against the Turks. Bessarion--who had a remarkably prescient sense of the power of the press--sent a copy to his friend Guillaume Fichet, Rector of the University of Paris, to be printed on the university printing presses. He then commissioned illuminators to decorate several copies for presentation to the great princes of Europe. 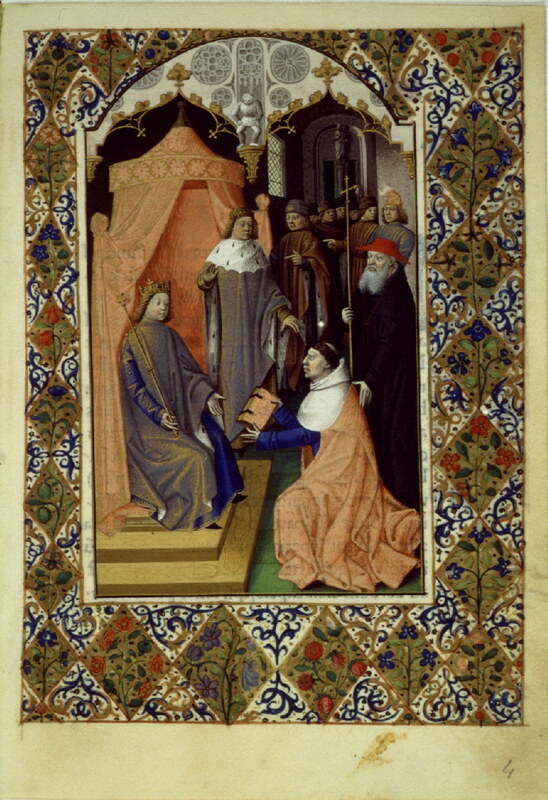 The copy on display was presented to King Edward IV of England; similar copies, sent to Louis IX of France, the Holy Roman Emperor Frederick III, and Amadeus of Savoy, have also been identified in modern collections. Among Bessarion's many scholarly writings, his translations hold no small place. Bessarion always intended them to be directly relevent to contemporary issues. His translation of Demosthenes' "First Olynthiac Oration" is an excellent example. Demosthenes' speech, written in the fourth century B.C., calls upon the Athenians to take immediate military action against Philip of Macedon while they can still defend themselves; he chides them for appeasement; he frightens them by describing the tyrannical nature of Philip's regime; he urges them not to let political rivalries with allied cities take precedence over the task of defeating the common enemy. The parallel to the contemporary Turkish threat was exact, to Bessarion's mind, and his marginal notes, shown here, emphasize the point. Humanism, which began as a movement to revive ancient literature and education, soon turned to other fields as well. Humanists tried to apply ancient lessons to areas as diverse as agriculture, politics, social relations, architecture, music, and medicine. 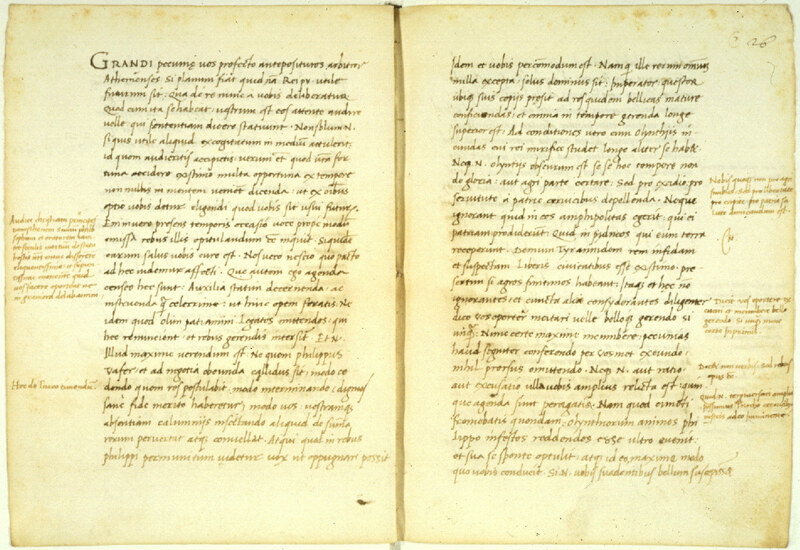 In the book on display, the minor humanist Roberto Valturio has tried to gather the military wisdom of the ancients for the use of his patron, the condottiere Sigismondo Malatesta of Rimini. Sigismondo was the nemesis of Pius II, who accused him of monstrous crimes and, in a unique action, "canonized" him to Hell after his death. But military secrets, in the fifteenth as in the present century, do not remain secret for long, and the present volume was in the hands of Sigismondo's great rival, Federigo da Montefeltro, within a dozen years of its composition. 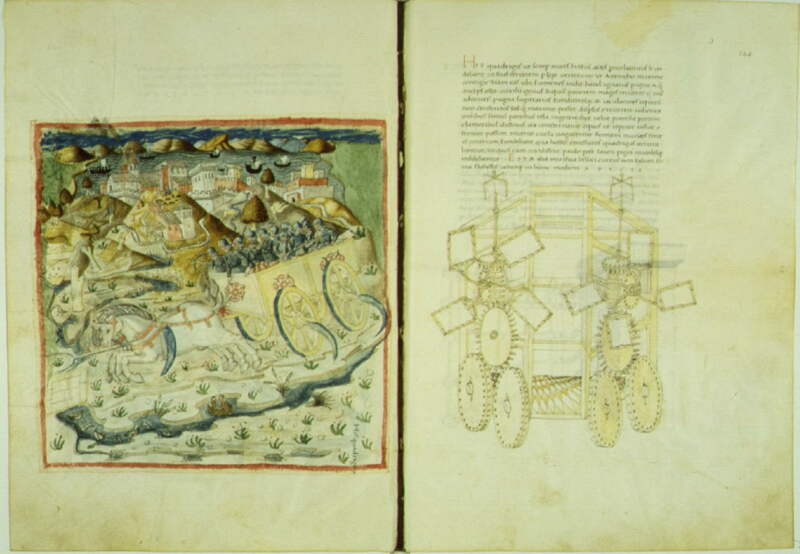 The text of the treatise is considered the most important Renaissance forbear of Machiavelli's "Art of War," while the rather fanciful illustrations are thought to have influenced some of Leonardo da Vinci's designs for war machines. In the Middle Ages, magnificent illumination such as this was rarely used in the decoration of secular texts. In the Renaissance, though sacred texts continued to receive the most sumptuous decoration, secular texts began to rival them for elegance of script, illumination, and binding. The manuscript on display contains the works of Virgil, who, with Cicero, was the most important of all ancient authors for the humanists. 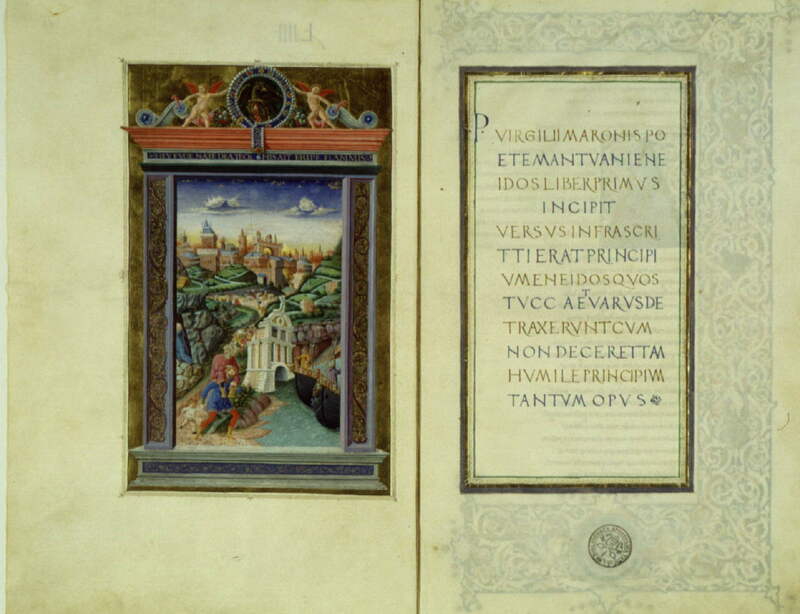 This is perhaps the most lavishly illustrated of all copies of Virgil in existence. It was made for Federigo da Montefeltro of Urbino, the commander-in-chief of the papal army, who was also the greatest book collector of the fifteenth century. Federigo's library, collected between 1460 and 1482, totalled well over 900 manuscripts in Latin, Greek and Hebrew. Most of the volumes were "bespoke", that is, written and decorated expressly for Federigo's collection. A great many were ordered from the Florentine bookseller Vespasiano da Bisticci. According to Vespasiano's memoirs, Federigo had thirty to forty scribes continually at work for him for twenty years to create his extraordinary collection. State weddings have always been occasions for public celebrations, and never more so than during the Renaissance, an age famous for pageantry and festival. 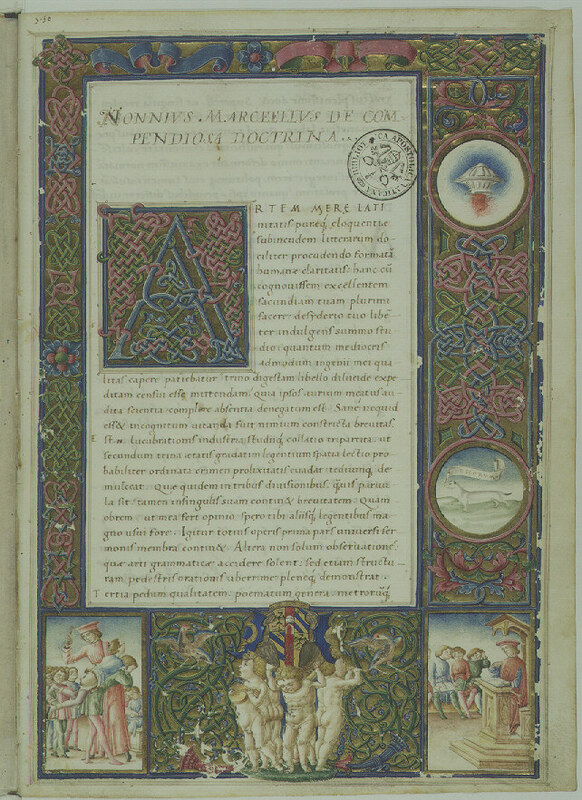 This fifteenth-century wedding book records the festivities surrounding the marriage of two minor members of great Italian families--Costantio Sforza, nephew of the Duke of Milan, and Camilla of Aragon, natural daughter of the King of Naples, in 1475. Their son Giovanni married Lucrezia Borgia in 1493. 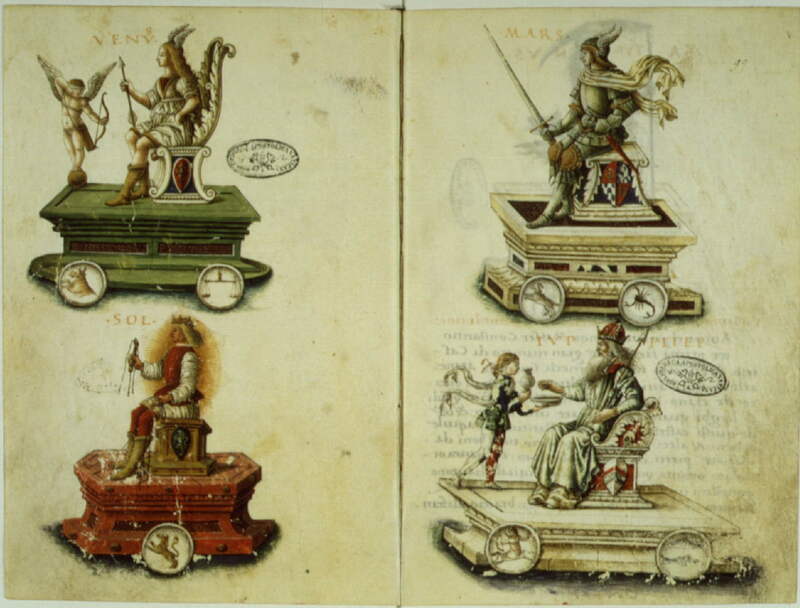 The wedding book contains copies of the poems and speeches written in honor of the occasion (including a two-hour-long Latin oration by the minor humanist Pandolfo Colenuccio), an account of the banquets and jousting, and drawings, shown here, of the costumes and floats. The basis of all the humanists' achievements was their mastery of Latin and Greek grammar. Grammar in the Renaissance had a broader meaning than it has today, comprising not only the study of accidence and syntax, but also the critical restoration and interpretation of texts--the whole art of textual interpretation. The Latin grammarians of late antiquity were, naturally, the first models for humanist grammatical study. But with the recovery of Greek literature during the fifteenth century, the West also gained access to the Greek tradition of grammatical writing, which was much more theoretical in character. Some Greek grammarians, such as Diomedes, the author of this work, were even interested in Latin literature, and so pioneered the comparative study of literature in different languages. This comparative approach was imitated by Renaissance humanists such as Valla and Angelo Poliziano. The elegant format and decoration of the present volume testify to the importance of grammatical study in Renaissance culture. On the right, a teacher lectures to an unimpressed group of young men. On the left, he administers discipline. And there is the route back to the Main Hall.